Cyclists in the City: Waterloo to Vauxhall - the South Bank route. Can you help make it a better place to cycle? Waterloo to Vauxhall - the South Bank route. Can you help make it a better place to cycle? Back in November, Kate Hoey, the MP for Vauxhall joined forces with the NHS (in the form of St Thomas's hospital) and local councillors to implement a ban on cycling along parts of the south bank, alongside the Thames. At 7 in the morning or at midnight, this is a glorious alternative to the rather nasty bicycle route along the main roads. I first profiled this back in November when I wrote to Kate Hoey and got a rather succinct response. A colleague recently sent another note to Kate Hoey and got a response saying that cyclists were 'upsetting walkers' and pointing to the very organised lobby that cyclists have. If that's the case, I'm not sure I've noticed cycling getting more lobby time than, say, the motor industry. Anyhow, the correspondence is included below for further reading. But what really strikes me is that the real issue is that total lack of an alternative road route for mothers, children, fathers, older people, people who are scared of the cars (who make up many millions, I would hazard to suggest) and others to cycle along. And it's a point that Kennington People on Bikes bangs home again and again with his recent articles. I think there are two strands emerging in reaction to the banning of cycling on the South Bank. 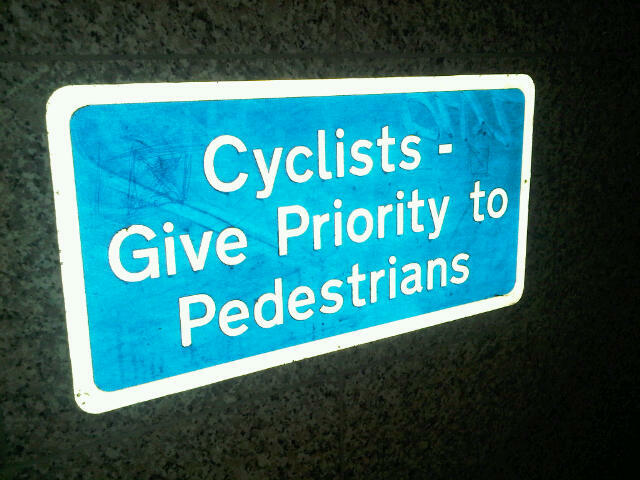 Firstly, that a large number of people think cycling should be allowed but that people on bicycles should give priority to people on foot. That seems only fair enough, especially where the space is constricted. And the irony is that the sign at the top of this article is actually on the South Bank greenway itself. It's just slightly further along from the stretch that is now banned to cycling at Vauxhall Bridge. Imagine a motorway where cars are allowed between junctions 1 and 3 but half way between junction 3 and 4, they're banned from using the route. This greenway needs a consistent approach, not something that is permitted here and there and banned here and there. And secondly, that people who use bicycles need to write to Lambeth councillors and to Kate Hoey and push for a better on-road solution. If you look at this article here, the road alternative can be a complete and utter joke. Personally, I find the approaches to Lambeth Bridge roundabout absolutely useless for cycling. If you're lucky enough to actually be able to get to the roundabout itself have to swing into the middle lane if you're intending to travel straight along the south bank and cars don't understand why you're in that road position. I've been variously honked, passed to closely, undertaken at speed and just the once actually driven into by a taxi from behind who wanted to push me out of the way on this junction. The problem is that the councillors and our MP don't use bicycles. They have no idea just how dreadful parts of this 'excellent route for cycling' are, how intimidating it can be or in fact what they can do to sort it out. I think we need as many people as possible to help them realise how they can make it a better place to bicycle. Further to my email below, to illustrate the point, this morning I was cycling along Upper Ground en route between Waterloo and Blackfriars when I had to pull out to pass a parked van. A Silver BMW estate following behind decided that he was not going to bother waiting for me to pass through and back to the road-side: he continued to overtake me in the half-width of road remaining, and brushed me with his wing mirror he was so close. I was lucky to retain my balance and not fall off. That is not the fault of the road, but it certainly didn’t help. I would not have net the BMW on the embankment path, and as a cyclist I represent a negligible threat to pedestrians, compared with that of motor vehicles – see Hansard here. I find myself writing to you again on the subject of cycle access to the south embankment path, this time in the context of the planned “Jubilee Greenway” which is supposed to connect up the various 2012 Olympic sites. I understand that, despite the Mayor’s bold assurances in answers to assembly members such as John Biggs and Jenny Jones, there is nothing very “green” about the route planned for the cycle section between Lambeth Bridge and the Tate Modern/Millennium Bridge – unless, that is, it refers to paint used to mark the on-road cycle path in this area. The route disclosed on the map on the “WalkLondon” website shows this following Lambeth Palace Road, around what used to be the Westminster Bridge Roundabout, and along York Road. This is one of the most hostile environments in London for cyclists. It then continues along Belvedere Road and Upper Ground which, while somewhat better, are hardly ideal – the relative narrowness of the road and extensive use of speed tables creates opportunities for taxis and commercial vehicles in particular to overtake cyclists (despite the fact that the whole area is a 20mph zone anyway), only to slam on the anchors at the next speed table and thus force the overtaken cyclist to brake hard too. Add to this the pinch points created by unloading vans, and the persistent parking offender with a blue Nissan X-Trail 4x4 on the double yellow lines outside the Mulberry Bush pub, and at times this stretch can be pretty unpleasant as well – indeed, I only use that road now because Stamford street, a much busier but also much wider road, is currently closed for water mains works. Overall, it jigs around like a thing possessed, left and right and left again, all the way along. I repeat my view that the entire embankment walkway could perfectly well accommodate cyclists as well as pedestrians. A similar set-up pertains on the Promenade des Anglais in Nice and that manages the potential conflicts between the two just fine. It would encourage far more nervous people – women, young families – to cycle who will simply not contemplate the road route. The great majority of cyclists, and especially those women/families, behave responsibly around pedestrians on a shared path. Any enforcement should be confined to inconsiderate cyclists who persist in riding at excessive speed – a small minority who seem to capture all the attention. At the very least, the route could be directed away from Lambeth Palace Road along the hospital service road which runs parallel to the embankment path from Lambeth Bridge to Westminster Bridge, and the across Westminster Bridge Road and along the section of Belvedere Road which runs past County Hall. I know you have a keen interest in sport, and are the Mayor’s Sports Commissioner, so can I please appeal to you not to envisage cycling as just something done around a velodrome or in other purely sporting contexts. The bicycle is also a mode of transport, described by Enrique Peñalosa, former mayor of Bogotá, as “merely a more efficient way of walking”. It needs to play a much larger role in the future of transport. It is good to see that the Boroughs of Lambeth and Southwark are generally quite supportive of this objective (compared for example with the City, Westminster or Merton), so please can we reflect this into the route of the Greenway in these boroughs? Phoey to Hoey! Just ride nice and enjoy the view.